>> Cartographic World will change dramatically because making map is very easy with the aid of "MAP MAKER KIT". It is inexpensive and easy to learn how to operate. 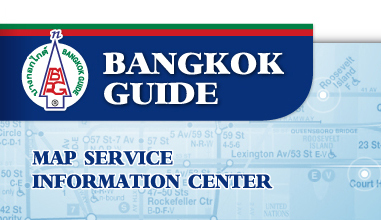 BANGKOK GUIDE TECHNOLOGY (1986) Co.,Ltd.. has been in "Map" business for 20 years. We create maps from scratch - planning, surveying, drawing and printing, including colors separation. For the past 8 years we have been using GPS solution for survey. We have developed many software for our business. We would like to share our expertise and experience to others, who want to make maps and use maps in the easy and less expensive way. We guarantee you that you will be able to make a map quick and easy with our Map Maker Kit. It does not matter whether you are a cartographer or GIS expert or not. All you need is a Map Maker Kit. The "Kit" will help you do MAP easier than you've ever done before. It will specially help you to mosaic the aerial photos accurately or update a new cut road on your current map. Map Maker Kit is a set of Hardwares and Software all in one solution. The unit is only 1 Kilogram in weight, with an antenna (Power pack DC 12 V option weight 1.2 kg), The removable Memory Unit will last for 14 hours with the interval time set at every 4 seconds, which is pre-set for record. The sensitivity of the angle turned also can be set too. It is our special Intelligence Technology. It's minimum requires just a computer PC 200 MHz. by itself, and use with all GIS software or use in desktop publishing business for quick and easy map making.